Migrate operation is used for synchronizing two schemas located in different databases. Source schema is selected on main screen schema list. This operation runs only with one source schema. On the operation wizard source connection and schema are already prefilled based on selection on main screen. User has to enter target connection that cannot be the same as source. Target schema is determinated automatically. If target database contains schema with the same schema ID as selected source schema ID, this schema is selected as target schema and update from source to target schema will be performed. If there is no such a schema in the target database, new one with the same schema ID is created. When synchronizing IJC items between the source and target database schemas the tool first determines differences between the schemas. There can be the following three types of differences. There is an IJC item in the source database schema that does not exist in the target database schema. This type of difference is determined by comparing IJC item IDs between the source and target schemas. If rephrased, 'Addition' means that for an IJC item in the source schema there is no IJC item in the target schema with the same ID. ?IMPORTANT: Please note that this type of difference could either be caused by a real new IJC item created in the source schema or by an existing IJC item deleted from the target schema. This is an ambiguity that cannot automatically be resolved. There is an IJC item in the target database schema that does not exist in the source database schema. Again, this is determined by comparing IJC item IDs and so more precisely this type of difference means that for an IJC item in the target schema there is no IJC item in the source schema with the same ID. ?IMPORTANT: As explained previously even this type of difference can either be caused by truly deleting an existing IJC item from the source schema or by adding a new IJC item in the target schema. Both the source and target IJC schemas contain the same IJC item (determined by IDs), but the item definition is different in both schemas. This means that either the source version or the target version or both version of the IJC item have had some of their parameters changed. A very basic example of a modification is renaming an IJC item. 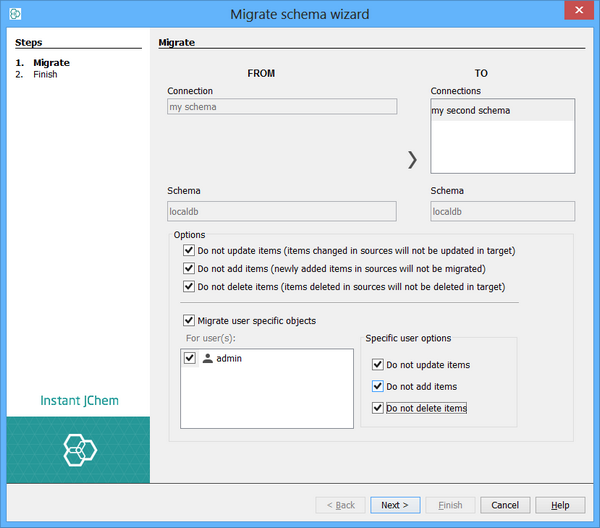 Performing addition, removal or modification can be disabled using “No Adds”, “No Deletes”, “No Updates” and "Magrate user specific objects" checkboxes on migrate wizard. Migrate user specific objects – migrate specific forms of each selected user(s). Please note while this checkboxes is disabled, Admin Tool migrate entirely global objects. After „next“ button clicked the subsequent wizard window is displayed. If User click on "finish" button with checked off "apply changes" is lead to last step of this wizard and changes is applied. In second case User doesn't check off the "apply changes", is lead to next step where User have to confirm If realy do the changes by clicking to the "Apply changes" button and in next step click to "Finish" button.